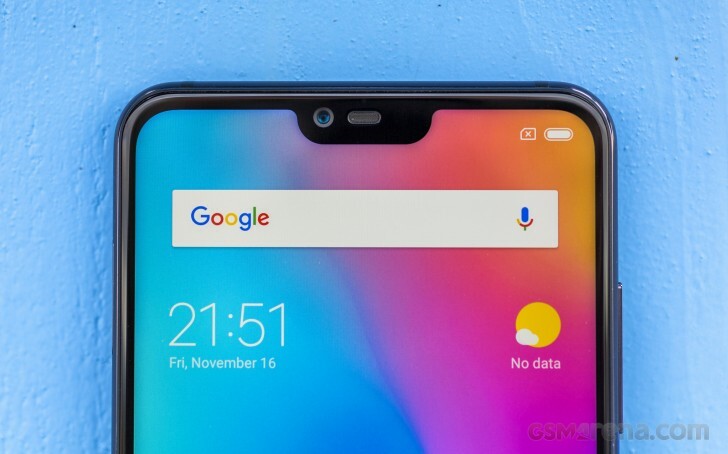 The Mi 8 Lite comes with a 6.26-inch IPS display with a tall 19:9 aspect ratio and 1080 x 2280 pixels resolution achieving 403 ppi. Or in other words - nothing too fancy except for the notch. Like it or not, it's there, but we didn't find it overly distracting because it's quite narrow. It just houses the earpiece, the front-facing camera, the usual sensors, and the subtle LED notification light. The only issue we had with the notch is the poor uniformity of the backlight around it and the top bezel. The small light bleed is most noticeable with a white or gray background and since the majority of the menus and apps use bright color palettes, the issue will be more prominent. Good thing you can visually hide the notch with a black strip across the top of the screen. Keep in mind that this is a mid-range device we are talking about here. Yet, it was able to surpass the 400 cd/m2 mark, which appears to be the median for today's affordable LCDs. It got 468 cd/m2 with the slider cranked up to maximum - it's not the best result out there, but it's just enough to make the content on the screen readable outdoors. Just avoid direct sunlight as legibility is far from stellar in this scenario. And as far as color reproduction goes, we suggest switching over to the "Standard" mode in the display calibration menu as it renders colors way more accurately. The "Automatic" mode spilled an average deltaE of 5 and maximum 10.1 while the "Standard" screen mode brought those digits down to an average of 0.9 with a maximum of 2, which is a stellar score. Note that deviations under deltaE=2 can't be seen with a naked eye, only with lab equipment. The trade-off here is that the maximum brightness will go down to 415 cd/m2. In the end, you will have to choose between accurate colors and slightly dimmer display or blue-ish whites and almost 470 nits of maximum brightness. With the default mode the sunlight legibility is satisfactory and our sunlight contrast ratio score puts it right behind the Huawei P20 Lite and the Motorola One. Again, we've seen better, but it's good enough to make the content readable under the sun - sort of. The handset boasts a generous 3,350 mAh built-in battery, but given that it powers up a powerful Snapdragon 660, we assume the battery life won't be all that impressive. After all, the Snapdragon 660 features eight Kryo 260 cores (4x running at 2.2 GHz and 4x running at 1.8 GHz) so there are no dedicated energy-efficient cores there. With Snapdragon 660, you sacrifice power efficiency for performance. Still, the 3G talk and standby times are respectable, to say the least. Only the web browsing runtimes keep the phone from getting a better overall score. The main takeaway from this test is that the IPS panel and the Snapdragon 660 chipset bring down the screen-on-time of the handset, so keep that in mind. Our battery tests were automated thanks to SmartViser, using its viSer App. 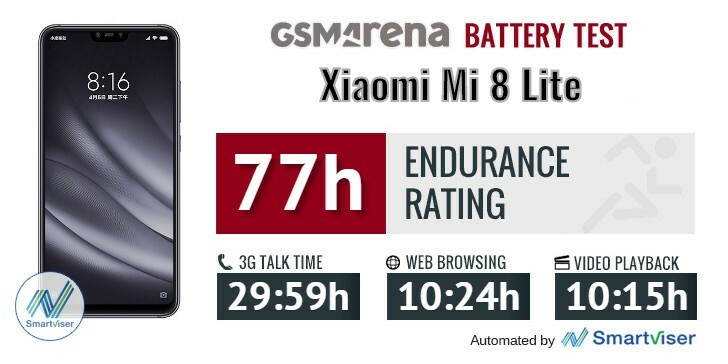 The endurance rating above denotes how long a single battery charge will last you if you use the Xiaomi Mi 8 Lite for an hour each of telephony, web browsing, and video playback daily. We've established this usage pattern so that our battery results are comparable across devices in the most common day-to-day tasks. The battery testing procedure is described in detail in case you're interested in the nitty-gritty. You can check out our complete battery test table, where you can see how all of the smartphones we've tested will compare under your own typical use. Compared to most of its competitors, the Mi 8 Lite drags behind, but it's important to note that only a few feature a powerful chipset like the Snapdragon 660. So there's that. Also, the results are almost identical to the Mi A2. Perhaps due to the largely similar hardware. The phone charged from 0 to 36% with the included charger, which isn't fast by any means but since the unit supports Quick Charge 3.0 standard, you can get yourself a third-party QC 3.0-compliant charger for speedier top-ups. For comparison, we used a QC 3.0 brick in the office and we got significantly better results - the cell replenished from 0 to 52% in 30 minutes. Not too shabby. The phone has a bottom-firing single speaker that gets pretty loud and according to our score sheet, it's assessed as "Very good." It will surely come in handy when you want to hear the phone ringing in loud environments. The Xiaomi Mi 8 Lite did splendidly with an active external amplifier, delivering very loud output with perfect accuracy. In fact, it was among the loudest smartphones we have tested lately, earning our approval. Headphones dropped the volume, but it still remained high. The degradation caused was slightly above average with a noticeable spike in stereo crosstalk, some intermodulation distortion and some frequency response shakiness all part of the picture now. It's still a very capable performer starting as high as it did, but the Mi 8 Lite is no longer top of the class here.